It is easy to become a user of Bicikelj bike share system. All you need is an e-mail address and a PIN code. If you stay in Ljubljana for a couple of months or longer, get yourself a yearly subscription. If just for couple of days or a week, weekly subscription will suffice. Subscription is almost free of charge: 3 € per year. After your registration is done you will recieve a user number and a code that you will need for every bike hire. Log on at a terminal, choose a bike, press a green button at the bike stand for your bike to be released and off you go! In case the terminal you are at is bike empty, log on at the terminal to see where the next closest station is located. To ride safely, respect traffic safety rules and use bicycle lanes where possible. In case of any questions or problems, contact the call centre: +386 (0)80 23 34. Bikes are of unisex shape. Before every ride set the bike seat to your hight. As tyres are not filled with air but rubber it may feel harder if you bumb into a curb or a hole in comparison to riding your home bike. There is a neat small basket in the front for your bag, a map, a camera or your snack or bottle of water. 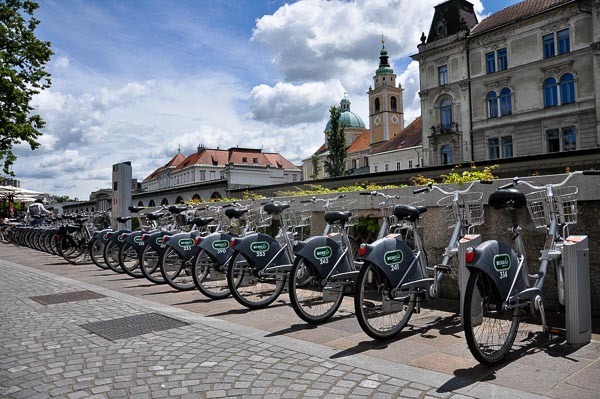 Ljubljana ranks among safest world capitals but it doesn`t hurt if you lock your bike when unattended. There is an anti-theft device built-in with a lock and a key. How to use it? Not too difficult: turn front wheel to the left, block a fork in a plastic gap and take out a key. To unlock it just use the key the way you use it for your house door. When you return a bike, put it in an empty slot. If an iron handle of your bike is stuck in a slot hole correctly, a small green light should turn on and a you should hear a double beep sound. If the station where you would like to leave your bike is full and has no empty slots, log on at the terminal to see where the next closest station is located. There are 51 stations all around the town, most in the center of the city and its vicinity. There is one by Preseren Square and one at the Open Market (mestna trznica) next to the Chatedral of St. Nicholas. There is also one on the Congress Square, one adjacent to Celica Hostel and the other in front of Hotel Park. Tivoli Park also has one, there are also two in BTC City and one by the Citypark shopping center nearby. Find the map of all the stations here.